Alaska Book Week is almost here! October 8-15; more info here. Join Hooked in celebrating ABW from wherever you are, by cozying up with one of Alaska’s many talented authors. This is a review of one of my favorites. Packing for halibut fishing last May was pretty simple. Longlining’s fast pace and grueling hours equate to minimal down time that is best spent sleeping. Practicing great restraint for someone who usually packs more reading material than clothing, only one book went into my sea bag: Walking Home, by Lynn Schooler. As soon as the gear was set, we retired to our bunks for a 2 hour nap. I nestled into my sleeping bag, book in hand. If I’d wanted to prioritize sleep, this was a mistake: Walking Home captivated me from the first page. The back flap reads, “Lynn Schooler has recently lost a dear friend and feels his marriage slipping away when he sets out into the wilderness to clear his head. His perilous solo expedition – first by boat, then on foot – takes him along one of the world’s wildest coastlines, being battered by the elements, fording a swollen river, and, for several harrowing hours, becoming a grizzly bear’s quarry. Though Schooler “set off into the wilderness,” Walking Home is no Into the Wild. Alaskans have little patience for Hollywood-ized stories of poorly-planned jaunts into nature. True to his forty years’ experience in Alaska, Schooler’s precautions were meticulous and humbling. This is someone I’d leave the dock with, I thought. That trust in the individual allowed me to trust the author, losing myself in his gorgeous prose. Schooler’s geographical subject, Lituya Bay, is a favored oasis of fishermen, a place particularly close to my heart. Close in physical proximity, too: at the time of my reading, we were 40 miles offshore, gazing eastward to the very coastline he trekked. His historical research was as extensive as his personal preparation, weaving several centuries of stories with his own. Though the region’s history and his adventure are fascinating, it was Schooler’s internal journey that truly resonated with me. His voice sounded familiar – the tone of so many men in this fleet, an entire generation selfless with their knowledge and time, keeping inner tumult as firmly guarded as a hot fishing spot. Following his unflinching gaze, insights absent of self-pity or blame, I found myself wondering if other fishermen had processed their own mid-life losses similarly. As bold a venture as Schooler’s solo hike was, the vulnerability of exposing his internal process seemed a far more courageous act. Well… Yes. I understood my friend’s disapproval. But I also recalled my own reaction to deeply troubled times, when I fled to the sea without a backwards glance to the loved ones left behind. Having needed to walk out on my own life a time or two, I recognized the necessity of movement. Death and decay are constants in this ecosystem, as they are in our lives. Out of loss comes new growth; as nature repairs herself, so do we. Following 1958’s great wave – the largest tsunami ever recorded, worldwide – Lituya Bay’s ravaged tree-line reasserts itself. The remains of shipwrecked vessels vanish from the coastline, as loved ones exit our lives. We grieve their departures, search for the lessons of our shared time, and continue on. Book lovers all have favorites that we return to, over and over, for familiar comfort and new insights among well-worn pages. When I finished Walking Home and immediately began to read sections to my shipmates, struggling to see the print through thickening twilight, I knew this would be one of mine. For anyone who’s spent time on the water or in the woods, who craves the wild spaces around and inside of themselves and knows the echo of their own companionship, Schooler’s work is utterly relatable. 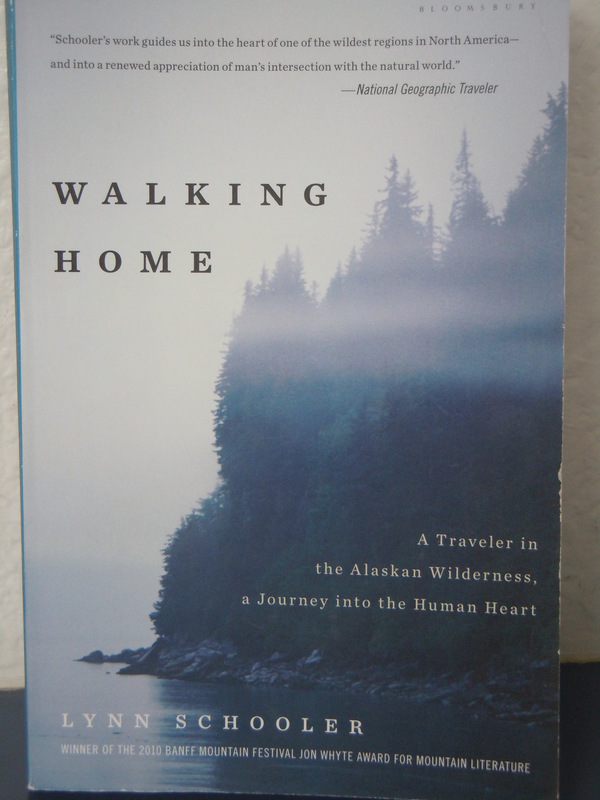 It’s an ideal read for Alaska Book Week. Those of you in/near Anchorage, mark your calendars for February 10-18, when Perseverance Theatre will perform a stage adaptation of Schooler’s 2003 memoir, The Blue Bear. 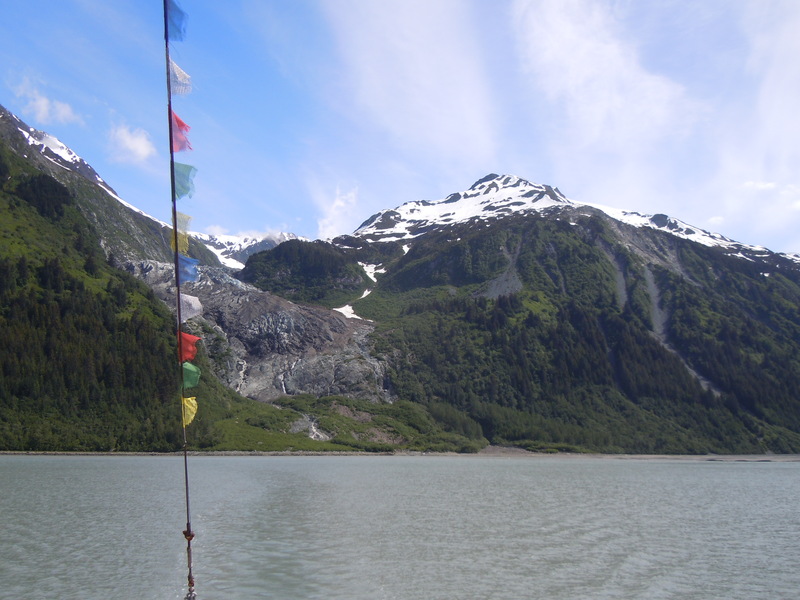 Stay tuned via Facebook, where you can subscribe to Lynn Schooler’s daily photo posts – stunning meditations on life in Southeast Alaska. And you, friends? What’s on your reading list for Alaska Book Week? Thank you for sharing this book with us! I’ve put it on my amazon list. Your account reminds me of my own reading of John Muir’s Travels in Alaska. I picked it up in Ketchikan and read it in my bunk on a cruise, and I was amazed how the landscape we were traveling through was still the same, and my own experience of it was pretty close to Muir’s so many years ago. Thank you also for commenting on my blog and letting me find yours. I shall follow your travels to at least be virtually connected to the stunning Northwest. So good to meet you out here! I’m avidly following your post lessons. That photo was taken in July, the beginning of our season. Three months and many Southeasterlies later, there’s not much left of them!